The basketball court at James Wadsworth Elementary School used to be unusable, and the slides in the playground area had holes and safety hazards. But now the Space to Grow schoolyard at Wadsworth is a place for everyone. 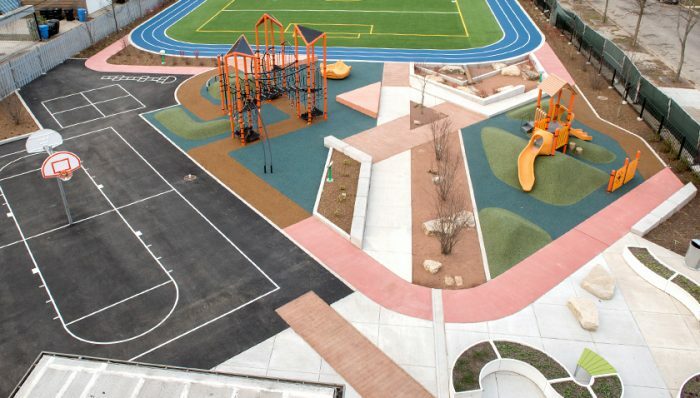 The schoolyard includes an elevated multipurpose turf field, jogging track, two half-court basketball courts, play equipment for younger and older students, outdoor classroom areas, rain gardens and a decorative water feature that utilizes roof runoff. Because Wadsworth is a STEM school, the students participated in the design process by creating models and drawings for the new schoolyard. It was important to implement as many of those ideas as possible, Principal Dr. Rashid Shabazz says. “If the students and the community had ownership of the schoolyard, they are protectors for life,” he says. Celebrating Wadsworth’s Space to Grow Schoolyard!